Tonga with its capital is located in Oceania (Oceania, archipelago in the South Pacific Ocean). It covers some 748 square kilometers (four times the size of Washington, DC) with a population of 106,479. Tonga and English are the languages spoken by people in Tonga. Thiscountry has no land-based border with any other country. Tonga is an archipelago in the South Pacific Ocean. The country is divided into four island groups, or regions. Apart from a few historical sites on Tongatapu most things to do in Tonga reflect its island nature. Diving, snorkelling, fishing, boat trips, kayaking and kite surfing are all possible. There are some lovely beaches if you just want to laze around. Tonga has some good restaurants and this is the place to come if you like lobster. Take time to learn a little about Tonga's fairly feudal culture and its many traditions. Go to church. Even if you are not religious the singing can be very moving. Watch tapa cloth being made from mulberry bark and try a drink of kava, the traditional drink, which is a mild narcotic. The topography is mostly flat islands with limestone bedrock formed from uplifted coral formation with others have limestone overlying volcanic rock. The average density of population is about 143 per km². The climate in Tonga can be described as tropicalmodified by trade winds, warm season (December to May), cool season (May to December). Potential natural disasters are cyclones (October to April), earthquakes and volcanic activity on Fonuafo'ou and moderate volcanic activity; Fonualei (180 m) has shown frequent activity in recent years, while Niuafo'ou (260 m), which last erupted in 1985, has forced evacuations; other historically active volcanoes include Late and Tofua. To reach someone Tonga dial +676 prior to a number. The local cellular networks are operated on 900 MHz, 3G, 4G. Websites typically end with the top level domain ".to". If you want to bring electric appliances (e.g. battery chaarger), keep in min the local 240 V - 50 Hz (plugs: I). The sign for the locally used currency Pa'anga is TOP. Red with a bold red cross on a white rectangle in the upper hoist-side corner; the cross reflects the deep-rooted Christianity in Tonga; red represents the blood of Christ and his sacrifice; white signifies purity. Tonga - unique among Pacific nations - never completely lost its indigenous governance. The archipelagos of "The Friendly Islands" were united into a Polynesian kingdom in 1845. Tonga became a constitutional monarchy in 1875 and a British protectorate in 1900; it withdrew from the protectorate and joined the Commonwealth of Nations in 1970. 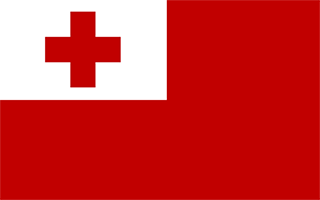 Tonga remains the only monarchy in the Pacific.